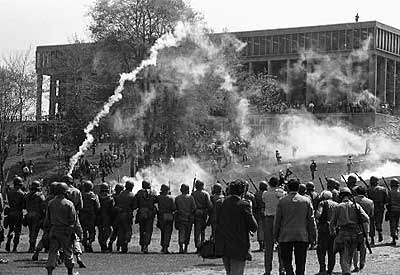 A forensic audio expert says a tape recording of the 1970 shooting deaths of four Kent State University students by Ohio National Guardsmen reveals the sound of pistol shots 70 seconds earlier. The Plain Dealer reports Friday that the expert’s review detected four shots matching the acoustic signature of a .38-caliber revolver. Witnesses have previously reported a confrontation involving angry students and a paid FBI informant who was photographing protesters. The informant was carrying a .38-caliber pistol. Some witnesses say he fired it to warn away angry demonstrators, which the soldiers could have mistook for sniper fire. The FBI informant has denied firing warning shots. The long-forgotten recording was found in a library archive in 2007.